Value-based care models that emphasize resident outcomes should have senior housing and skilled nursing providers seriously weighing the opportunities in joining forces. That was the main message from National Investment Center for Seniors Housing & Care (NIC) president and CEO Brian Jurutka on Wednesday as he opened his organization’s Spring Investment Forum in San Diego. “The needs of the residents really are pushing for some of those partnerships,” Jurutka said. Around 3 million older Americans live in senior housing or care facilities, Jurutka said, and many require assistance with activities of daily living. 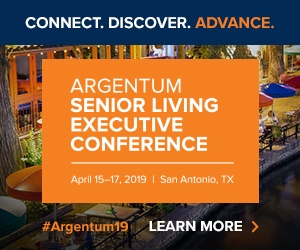 As the baby boom population ages, that demographic will drive a significant portion of the nation’s overall health care spending, presenting an opening for skilled nursing and senior living operators to find savings together rather alone. “That’s the collaboration opportunity between seniors housing, skilled nursing, and the broader health care ecosystem,” Jurutka said. Jurutka specifically called out Institutional Special Needs Plans (I-SNPs), special in-house Medicare Advantage options that cover long-term care residents, as well as strengthening partnerships between hospitals and referral partners and bringing specialized health care services into the senior housing setting. Given estimates that about a third of all health care spending can be classified as extraneous or wasteful, Jurutka estimated that such partnerships could save up to $700 billion. In addition, fostering such collaborations — for example, a full continuum of health from assisted living to skilled nursing and hospice care — could provide a competitive advantage for players at all points along the spectrum, making the collaboration piece a financial consideration as well. And already, some senior living providers are turning to these kind of partnerships. Jurutka pointed to a new consortium of four companies — Christian Living Communities, Juniper Communities, Ohio Living and managed services partner and risk management company AllyAlign Health — as one example of what those partnerships might look like in the future. Bob Kramer, NIC’s founder and strategic advisor, echoed Jurutka’s sentiment. Skilled Nursing News Editor Alex Spanko contributed reporting and writing to this story.